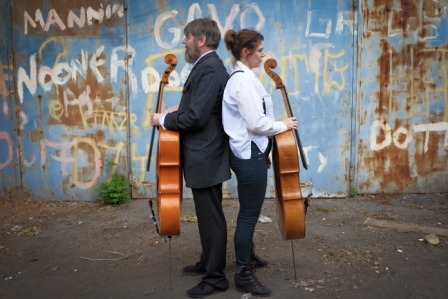 Kevin Murphy is an experimental cellist and composer whose dynamic and innovative approach continues to challenge the accepted scope of music for cello. He has been involved in numerous collaborations over the past twenty five years, including with notable rock/avant garde artists such as The Band, Dave Gahan (Depeche Mode) and Gavin Friday. He has also collaborated with Irish traditional artists John Spillane, Ger Wolfe and Cormac Breathnach. He is a founding member of renowned experimental Irish bands Seti The First and Slow Moving Clouds. Kevin recently co-composed the score for Michael Keegan Dolan’s award winning dance/theatre show Swan Lake/Loch na Heala. Mary Barnecutt is a musician based in Dublin. As a composer–performer, she has created music for film, theatre, dance and educational projects. She has worked with artists such as Chequerboard, Julie Feeney, Adrian Crowley, Seti the First, Vanishing Lakes, Vyvienne Long, and Slow Moving Clouds, currently performing with them in Teac Damsa’s critically acclaimed production of Swan Lake/Loch na hEala on tour.